The Witching Hour is Coming! Hundreds of East Hull residents take part in event as Absolutely Cultured gives a taste of its Spring production. This weekend around 500 residents of the area surrounding Wath Grove, East Hull met by moonlight between twilight and dark as Absolutely Cultured gave them a glimpse into The Witching Hour – its spring production in partnership with Wirral Borough of Culture 2019. Taking place in East Park as night falls from 3 until 5 May 2019, and again in Birkenhead Park in Wirral from 17 until 19 May 2019, The Witching Hour is a large-scale, outdoor, immersive performance by renowned theatre company Periplum. Building on Hull 2017’s immensely successful Land of Green Ginger project, it aims to use culture to breathe energy into two places – east and west – and to connect communities on either side of the country. Designed to inspire imagination and celebrate local tales, memories and folklore, the performance explores stories of local wise women, magical mythical characters and childhood memories from East Park in Hull and Birkenhead Park in Wirral. The Witching Hour will immerse audiences across the country in a unique and shared experience, weaving a story between the two locations. As a prelude to The Witching Hour, last week mysterious invitations were hand delivered to over 700 residents surrounding Wath Grove, an area off Holderness Road, as they were invited to gather to experience a unique night of fire, magic and wonder. 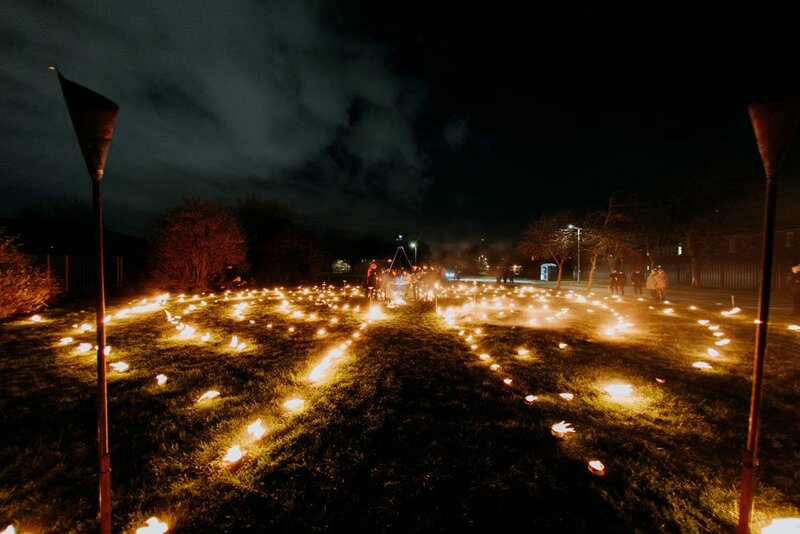 Called by the souls of the east and tied into the narrative of the main event, at twilight on Saturday and Sunday nights, a labyrinth of fire appeared on the green on Wath Grove. Residents were guided by performers to walk through a maze and make a wish. Immersed in the performance, they created their own act of magic as colour changing flames, sparks and smoke filled the air, and characters gave them further details about The Witching Hour and what is to come later this spring. Katy Fuller, Chief Executive and Creative Director of Absolutely Cultured, said: “We’re delighted that so many residents around Wath Grove took up our curious invitation to attend this special event. As dusk fell, the anticipation rose and people really got into the spirit of wishing for a little bit of magic for their community, sharing ideas about what they could collectively wish for. For further information about The Witching Hour, visit our event page.